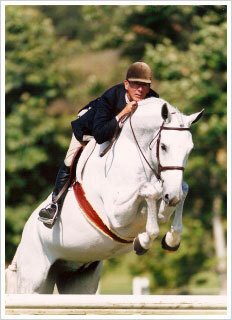 John French is a magician, piloting horse after horse to stardom in the hunter ring. He is recognized as one of the most accomplished hunter riders in the sport today, with titles like Professional World Championship Hunter Rider (twice) and Inaugural Winner of the 2009 USHJA Hunter Derby, riding equine superstar, Rumba. In his videos, John thoughtfully sheds light on the key ingredients that result in winning rounds. A: My mother was a riding instructor and we boarded horses on the farm my parents leased. So I was riding or being led around on ponies at about 3-years-old. A: I rode mostly with my mother growing up. 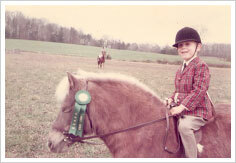 I was in the Pony Club, 4H and fox hunted all at an early age in Baltimore, Maryland. A:The first pony I really called my own was Vickie. She was a Pinto or Paint Shetland pony. She was only about 12 hands. I used to fox hunt her and ride across country jumping 3'6" chicken coops and post & rail fences. A: I always knew I wanted to be a professional. As a teenager, people at the barn would ask me to school their horses, and at shows people would ask me to show their ponies. I loved doing that. At the end of my junior year I went to groom and ride for Daniel Lenehan and his son Brian. They were a famous horse family and Mr. Lenehan was one of the greatest horsemen of all time. A: My mother was also into eventing, so I used to do a bit of that. I never really liked the fact that all you had to do was get over the fence and it did not matter what it looked like in regards to faults. I wanted to be perfect and get every fence exactly right. A: I won the Maryland Equitation Finals at the age 16. I had stopped showing my horse that year because I thought it was too hard to compete against some of the top show barns. Then I decided to go to the finals, borrow my friendʼs horse, braid it and trailer it myself. I even trained myself that day. A second memorable moment was when I won the Regular Working Hand class at night at Washington International. I was first, Rodney Jenkins 2nd, Katie Monahan 3rd and Charlie Weaver 4th. A: Of course my mother, who taught me to appreciate everything. And Bernie Traurig, who not only took me further than I thought I could go in the jumpers, but in doing so, made me a better hunter rider. A: My favorite time to ride is early in the morning and usually by myself. Thatʼs when I think of ideas on training myself or others. It is also therapeutic and relaxing. I especially love riding cross country on a fall day in Maryland or Virginia. There is nothing more mentally relaxing than that. A: Every horse is different, there is not just one system for every horse. You can learn a little from different trainers and especially from watching what works. Some of the best teachers are the horses themselves. A: I own about 6 horses right now, mostly young horses 3-years-old. Q:Career aside, non horsey accomplishments or interests? A: As a child I was a quite a good gymnast and sang with a folk group, but had to pick one due to the hours of practice and I chose riding. Just recently, I sang the National Anthem at the World Cup Qualifier in Thermal, CA. 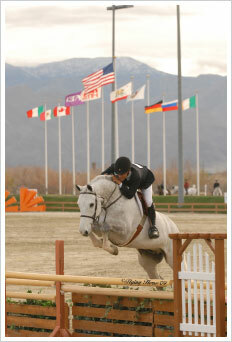 A: Equestrian Aid Foundation, equestrianaidfoundation.org. American Hunter Jumper Foundation, ushjafoundation.org. They have a special foundation for riders, trainers, grooms, etc. to help during times of hardship or injuries. Q:Your inspiration to ride and teach? A: There is always a new challenge and a new goal. Whether itʼs a horse or a rider, or maybe itʼs just the love of horses. As a junior winner of the Maryland Equitation Finals and Reserve Champion Virginia Equitation Finals. 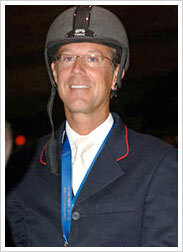 2003 - Rode in the World Cup Finals in Las Vegas also rode for the US Team at such shows as Falsterbo Sweden, Royan France, Cummen Belgium and rode for the US in Spain. FOR EVEN MORE INFORMATION ABOUT JOHN, GO TO: waldenbrookfarm.com. John French discusses and demonstrates exercises that perfect landing on the correct lead for that extra edge in a hunter class. John French describes in detail the overall look and conformation that make up the ideal hunter type. John French finally shares the secrets of his legendary eye. In this video he reveals his favorite exercises that will not only develop your eye, but the confidence to find the distance to every jump.